Things got heated between candidates in the Alaska governor's race at a debate Tuesday in downtown Anchorage, with Gov. Bill Walker, an independent, and Democratic candidate Mark Begich both zeroing in on Republican Mike Dunleavy when they had chances to ask an opponent questions. 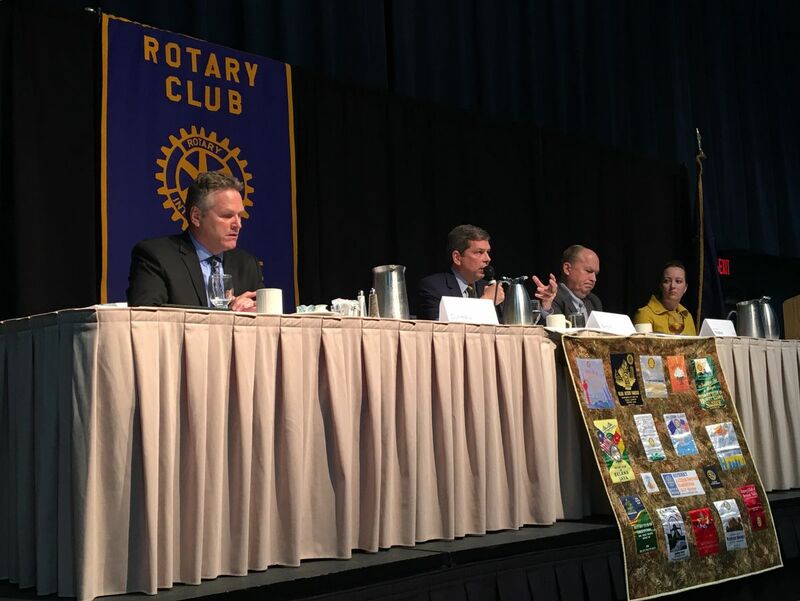 At the midday debate, hosted by the Anchorage Rotary Club, Walker brought up events Dunleavy had been absent from, including an NAACP-hosted forum in September and a debate focused on the Permanent Fund dividend at the University of Alaska Anchorage Monday night. "I think it's pretty disrespectful the way you have said no to so many different groups across the state of Alaska," Walker said. "Why won't you show up and participate in the process that allows Alaskans to find out, understand your math? You throw out math that doesn't make sense, so why have you been so aloof and avoiding Alaskans in this process?" People in the crowd applauded. Dunleavy shot back that he has "been to debates for the past nine months, I've been to more debates than you have been, more forums than you have been, more town halls than you have been." The one-hour forum happened just before an announcement from Walker's office Tuesday afternoon that Lt. Gov. Byron Mallott had resigned. Mallott had been running for re-election with Walker. The announcement of his abrupt resignation came just over an hour after the end of the forum, but it was not mentioned or alluded to as candidates traded jabs. Begich focused his first question during the debate on Dunleavy's record related to crime, asking about Dunleavy's time as a state senator. "You cut all the programs that could help us combat crime," Begich said. "How will voters trust you to do the right thing when your record is very, very clear on crime?" Dunleavy pointed to an endorsement he got last week from the Public Safety Employees Association, which represents Alaska State Troopers and other state law enforcement personnel. "They believe that I'm the guy that will focus on crime and actually make it happen, actually make crime go away," he said. This is hardly the first time the other candidates have hammered Dunleavy on not attending debates and forums. At a previous forum, Walker posed his question to an empty chair that had been reserved for Dunleavy. "Where are you?" Walker asked. Dunleavy used both of his chances to question an opponent during Tuesday's debate to focus on Walker. Citing crime rates, unemployment, and educational outcomes, Dunleavy's first question to the incumbent was: "Why should the people of Alaska trust a governor who has failed in so many ways?" Walker answered by challenging Dunleavy to a debate, and Dunleavy agreed. "I challenge you to a debate, we can actually have a discussion about those issues. You've been talking about them, but only in sound bites," Walker said. The candidates also discussed the Alaska gas pipeline project, how they would encourage growth in the state's private sector, and more. WATCH: All three candidates in the 2018 governor's race will debate questions encompassing growing the private sector, Knik Arm Bridge, addressing the Port of Alaska, the deficit, and more.